Published in the December 2011 issue of Qatar Happening magazine. Unedited version appears below. Download a PDF of the published version. Lorena Manescu’s music teachers couldn’t understand why their star pupil wanted to audition for the Qatar Philharmonic Orchestra. The 21-year-old Romanian violinist had worked so hard to get to where she was today: endless lessons and victories at music competitions had made her a child prodigy in her home country, and she had endured penurious living conditions to study at the prestigious Vienna Conservatory in Austria. Her talent meant that she could play with dozens of orchestras in cosmopolitan cities around the world. So why did she want to live in some tiny country in the Persian Gulf? But to Lorena the opportunity to play with the QPO seemed like destiny. “I had this dream to go to Arab countries – I‘ve had a passion for this since I was 15,” Lorena explains to me when we meet for our interview at Cafe Tasse in Souq Waqif. Four years after that fateful day, she is now a first violin and the youngest member of the orchestra. Only 25 years old, the Romanian beauty, with wavy black hair down to her waist, speaks with the confidence of a person who has fulfilled a lifelong aspiration and is now content with her lot. “I love living here and I think I imagine myself being here forever,” she says whimsically. When she describes what she loves most about the country, Lorena’s dark brown eyes express a sense of wonder unjaded by years of living as an expat in a culturally dissimilar land. “I still feel privileged about the social land here. There are a lot people from all over the world and a lot of [different] social backgrounds,” she says. Despite having arrived in Qatar at the start of Ramadan in 2008, when “everything was closed,” Lorena describes her first few weeks in the country as the happiest of her life. And she fondly recalls her first journey into the desert. It’s hard not to ascribe symbolism to her words. For just as the desert, the sea and the sky blend to create Qatar’s endless landscape, so too do three enormous and infinite entities combine to define Lorena’s essence: music, spirituality and education. And her decision to live in Qatar has allowed them to intertwine in sublime harmony. 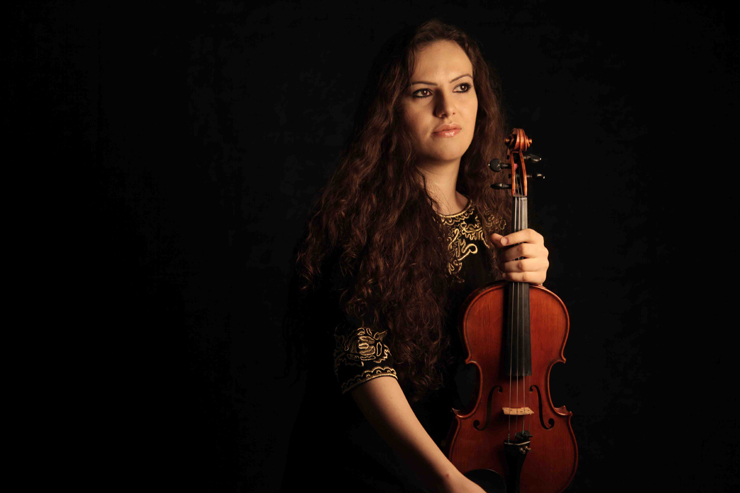 Lorena’s passion for the violin was sparked when she was a young girl living in Polovragi, a small village in the heart of Romania’s Carpathian Mountains. Raised by her maternal grandparents while her mother and father earned a living in the city of Râmnicu Vâlcea, Lorena spent her youth surrounded by luscious greenery, gardens and many animals and pets. Although she says she wishes there were more local children her age to play with, she remembers these years as idyllic. Her grandparents were old-fashioned, patient people. Her grandfather, a well-known fiddler in the region, began teaching her how to play the violin when she was five years old, and her grandmother was a music teacher in the local school. The hours she spent listening to her grandparents and their students play folk music kindled in her a desire to perform. Lorena got her chance at the age of seven when her parents and grandparents agreed she was better off studying music at a school in the city. For the next several years, her life was filled with classes, recitals, festivals and competitions. In high school she transferred to a music college in Bucharest to seriously hone her skills. Lorena can only recount good memories from these early years as an aspiring musician. She speaks affectionately of her fatherly instructors, the friendships she made and her classes’ various excursions around Europe. All of Lorena’s experiences during this period shaped her in some way. But a recital in Munich at the age of 15 changed the course of her life and set her on a path to embracing a new culture and faith. There she was placed with a host family whose patriarch was a Lebanese composer. “In his home I saw a lot of Arabian designs like Arabian pillows, curtains, music instruments, and his music was so Arabic. I fell in love with all those and this is how it started,” she explains. As she grew older Lorena dove deeper into the world of Islam, and she began to identify as a Muslim at the age of 18. She says she embraces the power of spirituality to shape and influence her music. “Sometimes when I used to have concerts with the orchestras as a soloist, I didn’t see this as a performance. I saw the stage like a sanctuary where you share your thoughts with the public. It is not just an auditive and visual connection, it’s an energetic and spiritual connection,” she says. Sadly, she’s afraid that much of the Arab world has failed to appreciate this mystical relationship. But she sees great potential in Qatar’s musical endeavors. Sheikha Mozah Bint Nasser al-Missned founded the QPO through the Qatar Foundation. Lorena believes Her Highness is trying to cultivate an appreciation for the arts through the orchestra and by simultaneously promoting education and a new image of Islam. Lorena says the Qatar Foundation ‘s initiatives have helped her to realize that education is the third most important part of her being. The organization’s motto – “Unlocking human potential” – has inspired her to do her part by teaching violin part time at the Qatar Music Academy in Katara Cultural Village. Although she does not have any Qatari students, she’s hopeful local curiosity will grow in the coming years. “I think it’s a long process. First of all it’s observation. They [Qataris] are observing what’s happening. Then it’s imitation – they will imitate what others are doing. And then maybe, inshallah, it’s creation, and they will also involve themselves,” she says. For now Lorena is happy to support the creative spirit in any form it manifests among Qataris. She speaks excitedly about the Bedouin rababa player she will travel to see after our interview. “I think I will feel very inspired after seeing him. The act of creation itself is one of the highest spirituality forms, and I really enjoy their enjoyment of producing something,” she says. As Lorena describes the music, I notice that she is dressed in a modest black top and a colorful peasant skirt – perfect attire for a night listening to Bedouin music in the desert. I am amazed at how easily she seems to fit in with the souq’s surrounding. It seems to me that she was destined to live in Middle East, as if she always belonged in the desert. But Lorena explains that her effortless adaptability has as much to do with her Romanian upbringing as it does with her lifelong fascination with Islam and Arabia. “Romania is a very mixed cultural country. We are really at the confluence between three major cultures, which is to the east the Turks, to the north the Slavic part through Ukraine, and to the west the Western European cultures. So we are really in the middle,” she says. Lucky for us this remarkable yet humble violinist feels at home with the QPO. Lorena’s talent and warm personality have surely contributed to the Qatar Philharmonic Orchestra’s success and sense of camaraderie. Her dedication to education and the arts is also helping to unlock the country’s intellectual and musical potential and transform Doha into a cosmopolitan city, perhaps one that Austrian conservatory instructors won’t hesitate to send their students to in the future.